Brenda Morgan, development co-manager for Northwest Portland's Sisters of the Road, holds an ink drawing done by a homeless man who draws to help him through painful heroin comedowns. 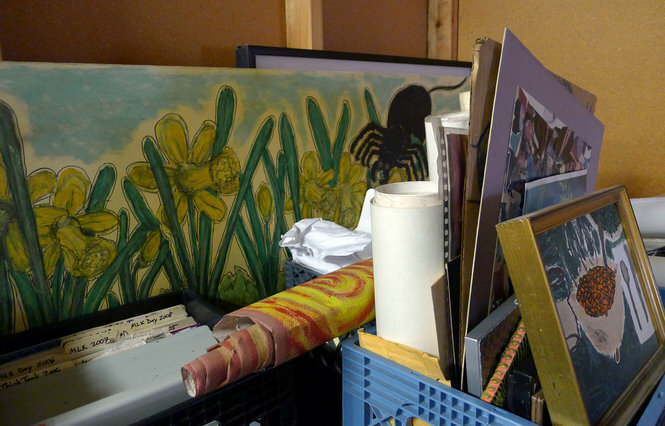 Sisters has a storage space in Northwest Portland full of artwork done by homeless people who have used their services for more than three decades. To get through painful comedowns following highs, the heroin addict draws -- bright colors and strong lines with a sure hand, creating beautiful surrealist images. He's about 50 and has lived on the street for a long time. 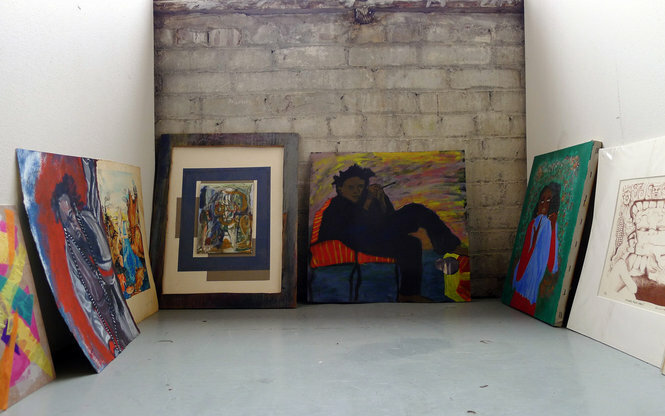 His drawings are being stored with scores of others, some dating back decades, in a Sisters of the Road storage space in Northwest Portland. "Imagine a person, hurting enough to be an addict, reaching inside to extract such beauty from himself," mused Brenda Morgan, development co-manager for Sisters of the Road, as she examined one of his pieces. He's still on the street, still struggling with addiction. But the art supplies Sisters and other organizations have long provided are an escape for him and others living on the street. Soon some of their art will be on display, during the organization's first Journeys Art Festival in May. "Art is healing for folks," says Jeannie Lawyer, who used Sisters' programs while she was homeless for many years. "It's nice to go inside, get warm, and forget." Now Lawyer has an apartment and co-manages the cafe at Sisters of the Road, which has offered a cafe and programs for Portland's homeless since 1979. In her spare time Lawyer is tracking down the stories behind the artwork in the storage closet; some dates back to Sisters' founding. The background stories will accompany the selection of the artwork to be displayed at the Journeys Art Festival fundraiser. Morgan hopes to find funding to someday make the pieces and their back stories a traveling exhibition. 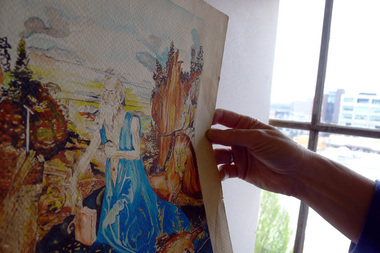 Lawyer knows many of the artists and their stories first-hand, from when she was homeless. 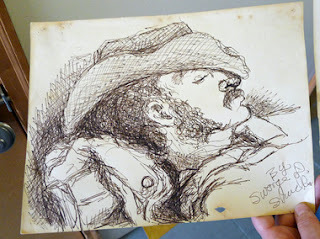 She laughs at a realist ink drawing showing a man sleeping, hat pulled low over his face. "That's Sarge, and he wasn't supposed to be sleeping there," she laughs. She was sitting beside the artist at the Sisters cafe counter in the early 2000s while he drew Sarge sleeping on the sidewalk -- technically not allowed. Lawyer gets a somber look on her face with the next piece: Bright colors frame red figures, screaming in anguish in the bottom corner of the canvas, but dwarfed by the brightness that overwhelms the canvas around them. "I look at this like that could've been me," Lawyer says. "A few years ago this was me." Another piece, a figure made of tissue paper pasted to poster board, is captioned on the back: "Think of me as one of you. Do not take me for a fool." A series of large canvases painted by Moe Schwartz in 1993 and 1994, when he was homeless, are done in a classic 1930s American style, with bold colors and near-realism. Lawyer says they scavenged the canvases from garage sales; other paintings are underneath. One painting shows people lounging around a fire under the Hawthorne Bridge as a bus full of wine-drinking aristocrats crosses. 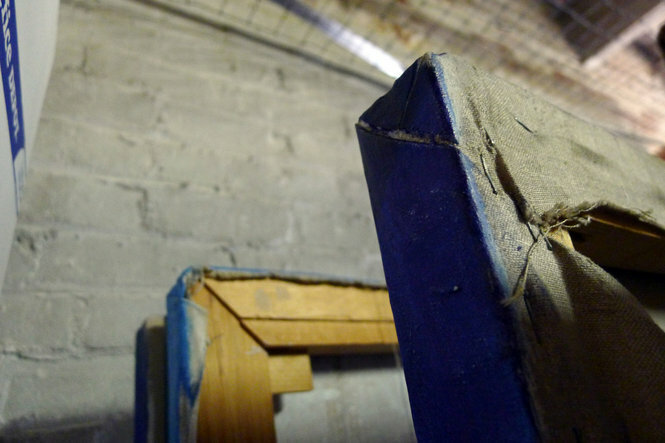 Others depict some seedy realities of homelessness. "Some people do art not to make something beautiful, but because it's what inside," Morgan says. "People can relate to art in a way they can't relate to other things. 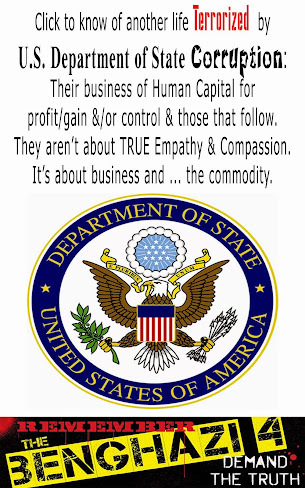 It gives a voice to people used to being silenced." 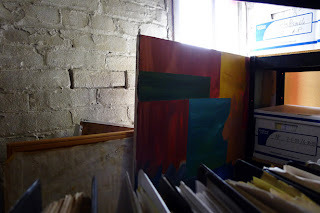 Canvases large and small, rolled and stacked, are stored in a Sisters of the Road storage closet. Some pieces date back to the outreach organization's founding; all are done by people who at the time were living on the street. Jeannie Lawyer says Sisters of the Road would get large canvases like these at garage sales, and customers would paint over them. A homeless artist made three of these large-scale paintings in 1993 and 1994. 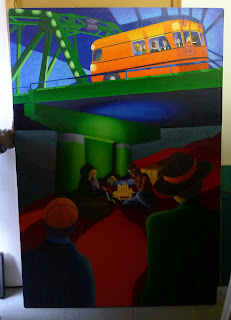 This shows people sitting around a fire under the Hawthorne Bridge while a bus full of aristocrats drinking wine crosses above. The others depict the harsher side of homelessness. 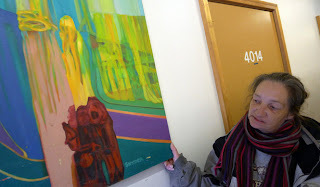 Jeannie Lawyer, co-manager of the cafe at Sisters of the Road, examines a piece painted in the 1990s and now stored with scores of other pieces painted by homeless people using the organization's services. Lawyer, who used to be homeless, says at one point, she was like the screaming people depicted in the painting. Sisters of the Road artists whose work is being stored in a Northwest Portland storage closet display varying levels of talent: Some are very skilled and practicing technique; some are just passing the time; some are both.